This hypnotic video proves that practice is more important than fancy tools. They say only bad workers blame their tools, and if this video from calligrapher Ian Barnard is anything to go by that's certainly the case. In a short video posted on his Twitter feed, you can see the lettering artist creating the kind of beautiful calligraphy that wouldn't look out of place on a fancy coffee shop sandwich board, armed with just a children's Crayola felt-tip pen. Is this the biggest piece of calligraphy ever created? Yes, it appears that practice really does make perfect. 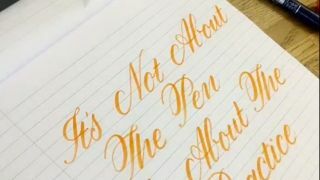 And if this video has inspired you to ditch calligraphy fonts and have a go at hand-drawn lettering yourself, you're in luck! Ian has guideline brushes you can download for free on his site. Check them out in the video below.